Columbia River salmon fishing guide, Kevin Newell welcomes you to join him for a Columbia River guided charter fishing trip! 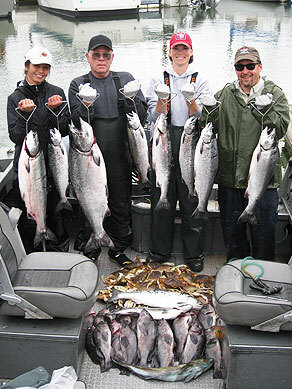 Incredible Spring Chinook, Coho Salmon, Fall Chinook and Silver Salmon trips! Columbia River fishing guides and charters like Kevin Newell have the ability to fish wherever they want and ply their trade on some of the best salmon fishing waters in the world, but many like myself continue to focus almost entirely on the Columbia River. It's easy to understand why when you look at the numbers of salmon that this river produces. The Columbia River has combined Chinook, Coho, and Sockeye salmon runs that often exceed 1.5 million fish annualy! Why would you want to go anywhere else? Great numbers of fish equal a great chance of your trip being the trip of a lifetime! The Columbia river is a huge piece of water but the Columbia River fishing guides that really know the river, can make it seem like you're fishing in a trout pond! The Columbia River has several species of salmon, each with it's own unique run timing and charachteristics that make each one truly special. We're going to go into some detail about these different types of salmon so that you will have some insight on why we employ certain fishing techniques, and why we focus on certain areas of the Columbia when we are chasing these fish. Hopefully some of this information will answer some of the questions you may have, and also help you in your search for a great Columbia River fishing guide! 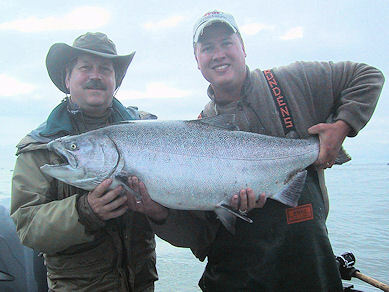 Columbia River Spring Chinook start arriving in force during mid March. The run consists of three year old and five year old fish. The bulk of the run, (greater than 70%) is three year olds and these salmon have an average size of 12 - 16 pounds. The five year old fish, while making up a lower over all percentage of the run, definitely make up for it with their increased size! These five year olds average 17 to 23 pounds with an occasional fish topping 30 pounds! The "Springer" as it is often called, is truly the jewel of the Columbia River's salmon runs! 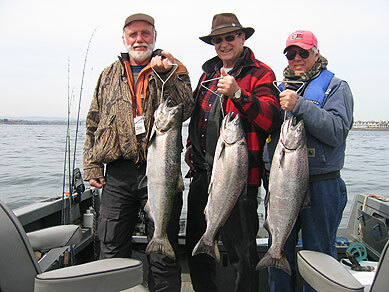 Spring Chinook season has a very high angler turnout. High angler participation in this fishery is primarily because the fish taste incredible and also because it is the first Chinook salmon migration of the year. Spring Chinook have phenomenal flavor, and that is not belittling our summer or fall fish which also make extremely good table fare, it's just that the Springers' flavor is head and shoulders above any other salmon out there. A good analogy is to compare it to cuts of beef; sirloin and rib eye are both fantastic, but Filet Mignon is the best! Spring Chinook are the Filet Mignon! They have a richer flavor that comes from their higher oil and fat content. This high fat content is what allows the salmon to survive their long journey upriver and is the result of their early return from the ocean. The Spring Chinook return early but they spawn at the same time as our fall fish and live off of their fat reserves during this time. The best location year in and year out to fish for Columbia River Spring Chinook is the section of river near Portland, Oregon and Vancouver, Washington. This is based upon my own personal success as a Columbia River fishing guide, and also based upon the angler surveys taken yearly by the Oregon and Washington Department's of Fish & Wildlife. During late June and early July anglers start targeting the Summer Chinook aka "June Hogs", and the plentiful Coho "Silver Salmon" that we have offshore in the ocean around the mouth of the Columbia River. Our Summer Chinook fishery in the river typically lasts about two weeks but dont worry, after that we are able to target fish in the ocean throughout the summer! Chinook and Coho Salmon begin to stage in the coastal waters off of the mouth of the Columbia from late June through August and this is hands down some of the best salmon fishing to be had anywhere! 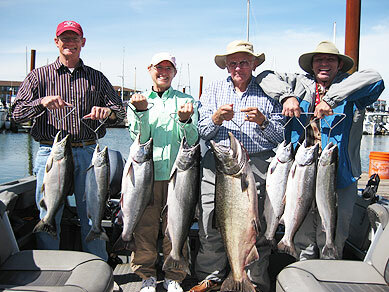 Summer Chinook average 12 to 30+ pounds and the summer Coho range anywhere from 5 pounds to 15+ pounds. Chinook, Coho, Crab, & Sea Bass! 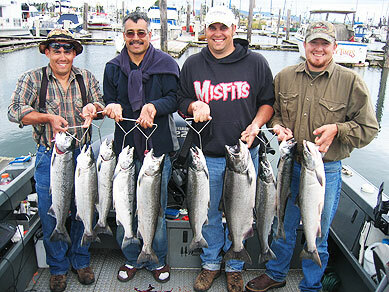 Typical ocean salmon fishing days provide a ton of action with limits of fish for everyone on the boat! A 20 plus fish day in the ocean is common! Some folks may ask "Why is the fishing in the ocean so good?". The reason is because these fish are still in saltwater and they are still voraciously feeding and fattening up for their journey inland. Most of the time it isn't a question of "What will they bite?" it's "What won't they bite!". In the ocean the Coho and Chinook have the feed bag on, and they don't slow down eating until they come into fresh water. These fish get big in just a few years by actively feeding and I take you to the place where that feeding frenzy happens. 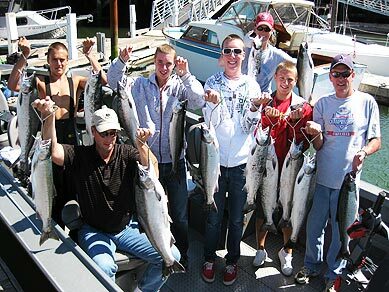 Ocean salmon fishing trips leave from the mouth of the Columbia River in Astoria and fish offshore a few miles. The weather is typically mild and the seas are generally very accomodating. One option to keep in mind when ocean salmon fishing, is that the trip can easily be combined with crabbing, fishing for sea bass, or even coming back into the river after limiting out on salmon and then fishing for sturgeon! Mid August finds us fishing near Astoria, Oregon and back inside the river meeting the Columbia River Chinook and Coho as they arrive fresh from the ocean! This area is called "The Buoy 10 Fishery", named after the red navigation buoy inside the river that is the salmon fishing boundary. 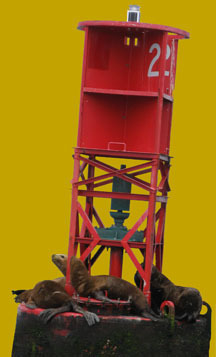 The actual Buoy 10 is about one mile inside the river, but the Buoy 10 fishery stretches from there upriver approximately 15 miles. This area is the premier west coast Chinook salmon and Coho fishing destination! Alaska quality fishing for a fraction of the price, with nicer weather and better accomodations. Buoy 10 Salmon Fishing = Results! If you're an Oregon fishing guide worth your salt then this is the area you are fishing during late August. The reason this area is so popular and productive is because it is the location where the salmon stage before heading up-river. During this staging period the number of fish in this area just keeps rising and they are still agressive and actively feeding. This is a good thing for fishermen because it makes the fish easier to catch! The Chinook during this time average 18 to 35+ pounds and the Coho will run 6 to 20+ pounds. The Chinook salmon fishing in this area closes during early September but Coho fishing remains open. September provides some incredible Coho fishing with often increased limits, large fish, and few other fishermen! Trolling is my preferred method for targeting salmon on the Columbia River. Other Columbia River fishing guides often just anchor or troll and anchor, but I leave the anchor at home. Why? Because trolling produces more fish day in and day out than any other technique on this river. Trolling is also a lot more fun because it is an active fishing technique! We are taking it to the fish, not just waiting, and wating, and waiting for them to come to us like when you anchor fish. Mobility and being able to keep passing your bait or lure through the fish holding area means you are going to have more fish seeing your presentation which equals hooking more fish! When I troll I like to keep the bait fresh by changing it often. I also like to move around if we're not getting bit. If we're not in the fish then we are going to go find the fish! Seeing the salmon's behavior patterns and working these patterns, consistently equals success for me, along with having the experience to know what options to implement when these patterns change. Thats what it's all about, getting on them, staying on them, and giving them something that they want to bite. Going fishing is fun, but catching a whole ton of fish is a whole lot more fun! That is my goal, take you out and have a good time fishing ... but have the best time possible by catching!